In 2014, there were 484 homes sold in Haymarket - a drop from the previous year of 511 homes sold. 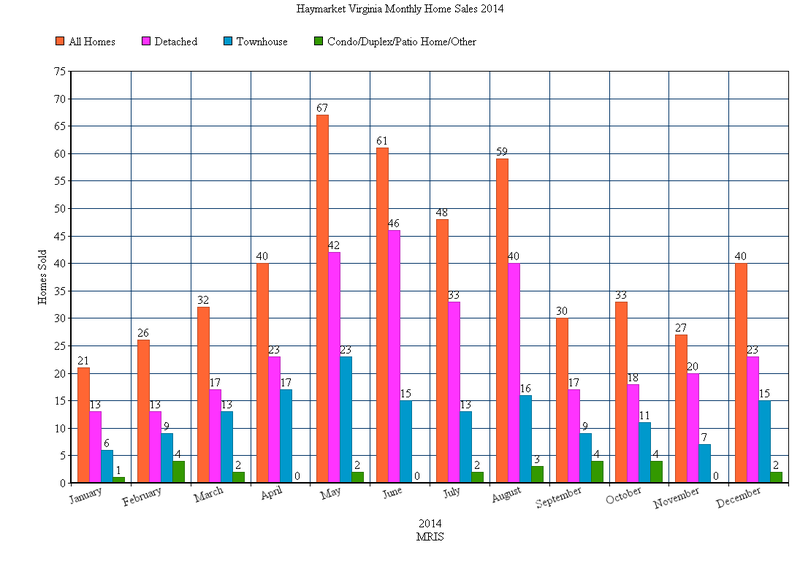 These are homes that were listed through the Metropolitan Regional Information System or MRIS. The decline from 2013's 511 sales transaction is not as much as neighboring Bristow and Gainesville, Virginia but shows that the overall housing market in western Prince William County is sluggish and still not where it should. Looking into the numbers, we see there were 303 detached homes, 154 townhouse and 26 others mainly consisting of Patio homes, semi detached and duplex's sold. We see almost identical average home price sold in Haymarket for the past two years which was $469,655 in 2014 and $469,866 in 2013. The average single family home sold for $543,735 with 4 bedrooms and 4 bathrooms with the original list price of $562,214. Average townhouses sold for $331,940 with 3 bedrooms and 3 bathrooms. The original list price for a townhouse was $340,975. The list to sold price ratio shows that homes on average sold for .9687% of the original list price. Just like Gainesville and Bristow, Haymarket also showed a drop of distressed home sales (Short Sales/Bank Owned)that can account for part of the decrease and all three areas had a better December (see chart below) than the previous year. We also see as we approach the summer months we have a strong increase of sales that last through August when families like to be settled in their new homes and get ready for the new school year.